NREL intern Jonah Richard adds solvent to polymers that will be added to nanotubes in order to single out species of them. They travel far and wide, from all corners of the country. They come from a diverse set of backgrounds, and they have very different plans for their futures. But the 54 student interns at the Energy Department's National Renewable Energy Laboratory (NREL) this summer all have something in common — a thirst for knowledge and a desire to apply what they have learned in school to real-world science in a state-of-the-art laboratory environment. Each summer, students make their way to NREL's facilities in Golden, Colorado, seeking an opportunity to work side by side with top researchers investigating the solutions to our energy challenges. "Students get to take their knowledge from school and apply it in a national laboratory environment," said NREL Education Program Coordinator Linda Lung. "The students are contributing members of these research teams. It's an invaluable experience for both the interns and their mentors." For summer intern Adam Atia, life in Colorado is a very different experience. Atia, born and raised in Brooklyn, New York, took the train to City College of New York each day while he sought his undergraduate degree in environmental engineering and earth systems science. As an intern in NREL's Center for Transportation and Hydrogen Systems, Atia is testing vehicle efficiencies and emissions. His primary objective for the summer was to get an infrared spectrometer up and running, which would supplement the lab's current emissions analysis data and allow researchers to analyze a wider spectrum of emissions for a variety of fuel sources. "This internship has been a great way to cap off my undergraduate degree with a different perspective on my work," Atia said. "My focus in school has been on air quality. The time I have spent in the lab at NREL has given me a chance to look air quality issues specifically from a transportation perspective. I am hoping to focus my future studies on renewable energy and sustainability while still applying my knowledge in air quality. This has been a great step toward that goal." On the flip side, intern Jonah Richard grew up in Corinth, Vermont, a town with no stoplights and only one paved road. That road led Richard to Bard College, a small liberal arts college in upstate New York, where he recently completed his undergraduate studies in physics. Richard chose to spend the summer at NREL's Chemical and Materials Sciences Center, investigating third-generation solar cells, which are still in early stages of development. 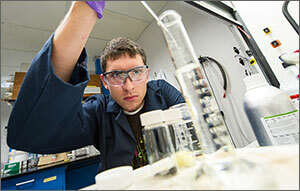 He is also looking into potential applications of carbon nanotubes in photovoltaics and has found the work rewarding. "I'd worked with fuel cells and carbon nanotubes ain the past, but had never worked with photovoltaics, and it was a great opportunity to come here to use what I've learned on a different application," Richard said. "The facilities are amazing at NREL. Coming from a small liberal arts college that doesn't have a lot of hands-on research labs, it has been a fantastic experience to be able to work in an environment like this." Coincidentally, despite their different backgrounds, both Atia and Richard are headed to Columbia University in New York City in the fall. Atia will be working toward a graduate degree in earth and environmental engineering while Richard continues his studies toward advanced degrees in chemical engineering and physics. For summer intern Rachel Welch, the knowledge and experience gained through her internship is beneficial as she investigates options for her future. Welch, a native of Galesburg, Illinois, will be returning this fall to Lawrence University in Appleton, Wisconsin, to finish her undergraduate degree in chemistry. While at NREL, Rachel is involved in research on thin-film solar cells at NREL's Chemical and Materials Science Center. Her efforts are focused on investigating new materials for solar cells and the best options for applying these materials to thin-film photovoltaics. "It's been a really great opportunity for me," Welch said. "The materials we are looking at are comparable to existing materials but are new to this application, so there is very little study of them. The work we are doing is important and challenging. Doing this work has been a great way to dip my toes into materials science along with my chemistry background to see if I might want to pursue that further in the future." Nurturing the next generation of scientists and engineers is a priority for the Energy Department's Office of Science and NREL. "This internship program is a critical pathway for encouraging these students to pursue the next level of excellence," Lung said. "These students will someday be the scientists and engineers that advance the work we've begun here today, and we will be depending on them to continue our efforts toward a sustainable energy future." To that end, each student intern is assigned a mentor from NREL's research community who guides and advises the students through their research and their collaboration within their teams. The students say their mentors are critical to their success. "My mentor has really been great and has always been available to help when I need it," Richard said. "The mentors here really value us as scientists and as a part of their teams, even though we are undergrads. To get to collaborate with them and the research teams on such a high level is a tremendous learning opportunity." The mentors enjoy the chance to work with such a talented group of young scientists and engineers and often find that they get as much out of the program as they give. "I am invigorated by the passion that the interns have for learning and the enthusiasm they apply to their research," said NREL Scientist Todd Deutsch, a former intern in the program and now mentor to summer intern Erin Brahm. "These interns are fully on board with NREL's mission, and they can't wait to get started on their projects and make meaningful contributions." While these mentors enjoy working with the interns and the personal satisfaction it brings, they also clearly understand how the intern program helps ensure that their research continues as we pursue solutions to our energy challenges. "The internship program at NREL advances our mission by exposing motivated students to scientific challenges related to sustainable energy technologies at an early stage in their career," said NREL Senior Scientist Jeff Blackburn, mentor to Richard. "These students then serve as ambassadors to our mission by starting discussions, research projects, and other programs at their universities. One energetic intern will inspire many others, helping to grow the pool of scientists needed to address our demanding global energy needs." For some interns, one summer at NREL is not enough, and they return for a second time, allowing them to dig in deeper on research topics they started the year before. Erin Brahm has been an intern in NREL's Hydrogen Program for the past two summers. Brahm, a native of Huntsville, Alabama, recently graduated with a degree in chemistry and mathematics from Sewanee: The University of the South and is heading to the University of California, Berkeley, this fall to pursue a Ph.D. in chemistry. Brahm has been investigating research topics around hydrogen production from water using renewable electrolysis. Her work is focused on developing treatment processes to stabilize the semiconductors used in electrolysis, and she has enjoyed the chance to be able to explore this technology extensively. "I've been an intern at NREL for the last two summers, and my research on this technology made me realize that this was the field I wanted to pursue as a career," Brahm said. "So I am back again this year, and I chose my graduate school program based on being able to continue research in this area." Brahm has parlayed her experience as an intern at NREL into a clear direction for what she wants to do with her future. "This internship program is really special because we each get a project that we see through from start to finish," Brahm said. "We are doing real science and get to experience the entire process. Everyone here is so focused and dedicated to their research, and it's fascinating to see all of the different disciplines and paths that are being studied to solve our energy challenges. It is an inspiring and amazing place to be." Adam Nelesson spends his time at NREL's National Wind Technology Center just outside of Boulder working with the Offshore Wind and Ocean Power Group. Like Brahm, he jumped at the opportunity to be able to return to NREL for a second summer to continue his research. The Flagstaff, Arizona, native and recent mechanical engineering graduate of Northern Arizona University is on his way to Georgia Tech in Atlanta this fall to pursue a master's degree in aerospace engineering. Nelesson has been developing a computer modeling tool for wave energy research that will allow for the replication of the performance of wave energy devices operating in realistic conditions. This modeling tool will be important as wave energy begins to be looked at more closely as a viable alternative energy resource. "It's been an exciting opportunity because this is such a young industry and it has little in the way of standards for what the devices are going to look like," Nelesson said. "As these devices come closer to commercial development, the need for good modeling tools is going to be increasingly important. I've really enjoyed the unique challenge of getting to do work as an intern in a new area where I feel that I can have a real impact." As a returning intern, Nelesson feels strongly that the lessons learned and hands-on experience gained at NREL will serve him well in the future. "The continuity of being able to investigate this technology for such an extended period of time has been a great opportunity, because this summer I was able to jump right in and hit the ground running," Nelesson said. "The work I will be doing in graduate school will look similar to what I've done here at NREL, so the experience I have had is going to apply quite well."